There are approximately 90 English sounds that we call all of them together phonics, and the 90 sounds are spelled in over 180 ways we call spelling patterns. Learning the 26 plain letters and using them in a word like “fast” is the easy part of learning to read and spell. More complex is the process of learning all the letters that do not sound like their letter name (to), and all the combinations of letters that produce a single sound (expression). The most complex part of learning English phonics is identifying which letter or combination of letters to choose when spelling every sound in every English word. Now that we the meaning of phonics, we can understand the relationship between phonics and spelling difficulties. Dawn took the straw·ber·ries out of the freez·er to let them thaw. Dawn drank her straw·ber·ry shake with a straw. 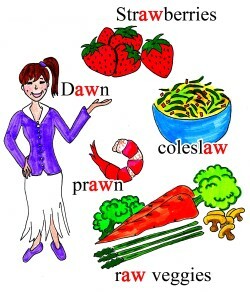 Dawn ate raw veg·e·ta·bles and cole·slaw. Dawn ate shrimp and prawns. Dawn was awe·some. Dawn was not awk·ward. Dawn spoke with a South·ern drawl. Dawn gave a long, drawn-out speech at her job. Dawn wan·ted to draw up a new plan. Dawn wan·ted to draw back from the com·pa·ny’s old a·gree·ment. Dawn saw a law·yer to dis·cuss busi·ness with him. Dawn’s com·pa·ny spawned hun·dreds of new com·pa·nies. Dawn wan·ted to with·draw her mon·ey from the com·pa·ny’s bank. Dawn’s with·draw·al was a huge with·draw·al. Dawn saw the fish spawn in the wa·ter. Dawn saw the taw·ny fawn at dawn. Dawn saw the shark’s big jaws. Dawn saw the ship being moored by a haw·ser. Dawn saw the cat’s long claws and saw the cat claw·ing at the dog. Dawn saw the dog’s paws as he pawed at the bone. Dawn saw the hawk kill·ing a dove. Dawn saw the dove’s maw. Dawn said that see·ing the hawk kill·ing its prey was aw·ful. Dawn heard the bulls bawl. Dawn re·mem·bers when her son, Law·son, crawled. Dawn re·mem·bers when she saw Law·son daw·dling near the wall and she asked him not to daw·dle. Law·son was a·ble to sprawl out his legs like a gym·nast. Dawn read a book pub·lished by McGraw-Hill. Dawn’s yawn caused her son to yawn. Law·son stud·ied law and be·came a law·ful law·yer. Dawn’s in-laws were im·mi·grants. Dawn’s in-laws em·i·grat·ed from War·saw to the U.S. Dawn’s father-in-law woke her up at dawn. Dawn’s father-in-law fixed the lawn·mower and mowed the lawn. Dawn’s father-in-law used a jig·saw to trim the trees. Dawn’s father-in-law used to be a car·pen·ter and he knew how to use a saw; he sawed wood for most of his life. Dawn’s mother-in-law was a raw·boned wom·an who liked to sit un·der the awn·ing. Dawn’s sister-in-law was maw·kish and that gnawed and awed Dawn’s mother-in-law. Dawn saw her brother-in-law pawn his watch at the pawn·shop. Dawn saw the law of·fi·cer at the pawn·shop. Dawn’s brother-in-law was taw·dry and scraw·ny. Dawn saw and heard the brawl·ing be·tween her mother-in-law and her brother-in-law. Dawn saw that her mother-in-law was in awe of her son. Dawn was drawn to her mother-in-law’s side. Dawn told her brother-in-law that he had some flaws. Dawn told her brother-in-law that she heard him brawl with his moth·er. Dawn’s hus·band, Shaw liked to draw. Dawn took her taw·dry shawl out of the draw·er and asked Shaw to draw her face. Dawn’s face was drawn by Shaw. Dawn and Shaw played chess and he lost two pawns at the start. Dawn asked Shaw to scrawl a note if he were to leave. In English, memorizing the 26 letters is not enough. Instead, one needs to memorize over 90 sounds we call phonics, over 180 spelling patterns of the 90 sounds, and memorize which of the spelling patterns to choose when spelling every single sound in every English word. 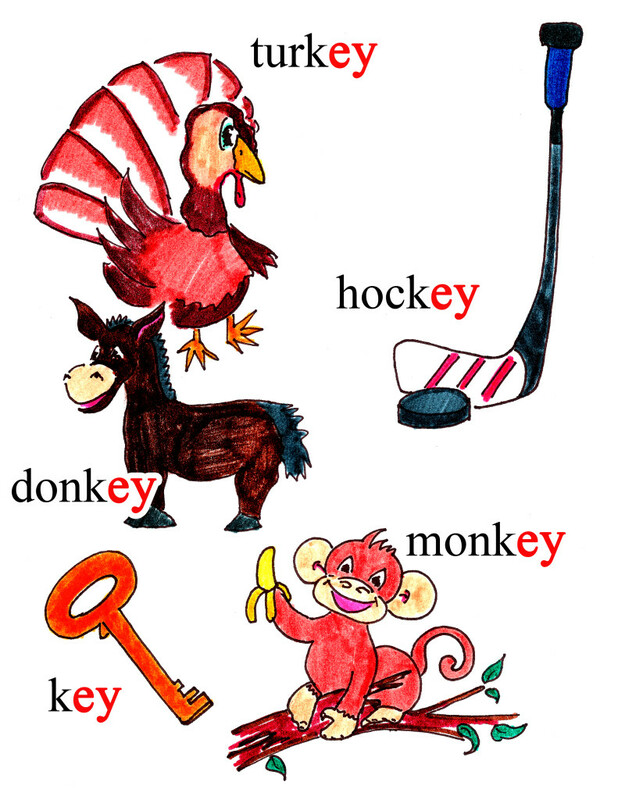 For instance, one needs to remember which of these 10 spelling patterns to choose when spelling the single long “e” sound in thousands of words, as in heat, meet, complete, we, receive, believe, elite, ski, lucky, and monkey. Do not feel discouraged for having to memorize so much without logic; I found logical solutions to help you spell hundreds of words at a time. Leave ask me how at the bottom of this page! Logical learners whose learning style is a logical learning style question why a single sound should be spelled one-way, and not the other. They are so logical, they expect “My cat is cute.” to be “Mi kat iz qut.” Without spelling rules, logical learners are the ones that become poor spellers. Lee, a 6th grader who could not read words, was told he had dyslexia in reading and in spelling, but Lee learned quickly when spelling rules were presented.